Poetry Friday: The Round-up Is Here! Welcome Poetry Friday friends! The round-up is a bit late, but here after all! Happy Poetry Friday, Tara! Thanks for hosting. Don’t stretch yourself too thin dear friend. Good for you for getting it all up! It’s FRIDAY!! Happy Poetry Friday, Tara! Thank you for hosting this week! Wasn’t it wonderful to see something uplifting and grounding at the same time! Glad you got to recreate your day! I love the poem but I love it even more in the context of your story about the morning and seeing them and then seeing the day in a different way. Thanks for hosting! Tara, my week has been like your morning! Wild geese always bring Mary Oliver to my mind. It’s a lovely poem. I love the reference to “to stop time when something wonderful has touched us.” I’m glad for your geese moment, and thank you for hosting today. Mary Oliver always fits the bill — what a beautiful poem. Thanks so much for hosting this week! Wow, what a busy end of your week! I think Mary Oliver is one way to grab a moment of rest amid the flurries! Thanks for hosting, Tara. Enjoy your day, and the weekend! Thank you for hosting this! And for posting that wonderful Mary Oliver poem this morning. One of my favorites. Thank you for this gift of Mary Oliver this morning, and an even bigger thanks for hosting. Another much needed poem today. Thank you for hosting. Noticing the little things helps to soothe our souls. Thank you so much for hosting– despite and in view of all the other demands on your time! The Oliver poem is a special treat; sorry for the traffic delay; glad for the resultant shared poem experience. Every blessing. “The geese flew on…” Good, or not-so-good, “all things pass away,” to quote St. Teresa of Avila. Somethings don’t seem to pass away quickly enough; other things, all too quickly. Especially during this holiday season, tanks for the timely reminders! …Hope all the lights on your return home flash green and only green for you! Thank you Tara for hosting today’s poetry friday and for sharing another Mary Oliver poem. I adore Mary Oliver, she captures nature and its wisdom so vividly that i find myself often pausing after a few lines to imagine, to absorb and to ponder her words. My selection is “Here’s A Little Poem: a very first book of poetry: collected by Jane Yolen and Andrew Fusek Peters and illustrated by Polly Dunbar. 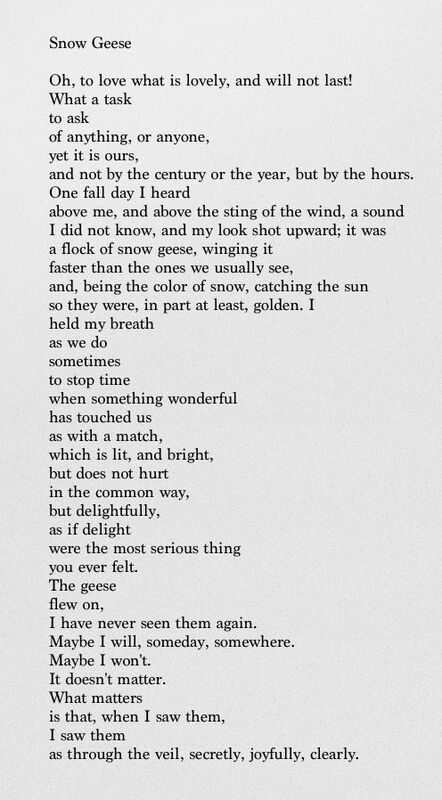 I love this, Tara–the power of nature and of poetry:>) A flock of honking geese flew overhead yesterday, here in MN. Too late for them to be migrating south; too early to be returning. What the heck? Our extended fall and now mild almost-winter have the animals all off-kilter. I always think of Oliver’s “Wild Geese” when I hear them, and, with even MORE love, Rachel Field’s “Something Told the Wild Geese.” http://www.poemhunter.com/poem/something-told-the-wild-geese/ Hope your weekend is calmer than yesterday/today! Tara, the flight of the geese paired with the poem brought back balance back to your hectic day. Feeling pressured at the holiday time is normal occurrence. Thank you for sharing a bit of white space for my day. Love the poem and the context–thank you! Sorry I’m a bit late to the Poetry Friday party this week! to find it again. Thanks for sharing this one, and for hosting!